Update: Since this report has published, Apple has confirmed that the iMac Pro release date is indeed December 14. Apple's own Phil Schiller first teased this imminent release to TechRadar sister site T3 in a lengthy interview. Then, the firm officially confirmed the release date via an email sent out to its customers, as CNBC reports. However, none of these reports specifically mention this as the UK or Australia release date – we can only assume it's the US date. We've contacted Apple for comment, and will update this story again with that information should we receive a response. The iMac Pro price will begin at $4,999, £4,999 or about AU$6,679. If you've been holding out upgrading your computer in anticipation of the release of Apple's iMac Pro, there may still be a chance you could find one under your Christmas tree. According to a report from Apple Insider, staff in Apple's enterprise sales team have been reaching out to long-term customers to discuss potential custom configurations (the RAM, GPU and peripheral requirements) they may be looking for. This is to allow companies to budget for the new releases, with "reliable, high-volume" customers potentially being given the option to enter financing agreements next week. That would, even in small quantities, let Apple make good on a 2017 release window, and take advantage of 2017 tax year benefits. It's been a long time coming, even if it does make it out the door this side of Christmas. 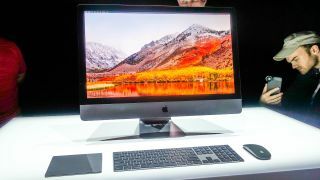 The iMac Pro came out of the shadows for a brief first-look at this year's WWDC showcase. With a 5K display, up to 18-core Xeon processor, as much as 4TB of SSD storage and a choice of Vega 56 or 64 graphics chips, it's a premium bit of kit. And, as you'd expect, pricing matches – you're looking at $4,999 (about £3,870, AU$6,680) when it eventually does go on sale, and that's for the entry-level specifications.